A SMART KAFTAN THAT IS SUITABLE FOR ALL OCCASIONS FROM RELAXING AT HOME TO GOING ON HOLIDAY OR DRESSING UP WITH JEWELLERY OR A SCARF FOR A SPECIAL OCCASION. 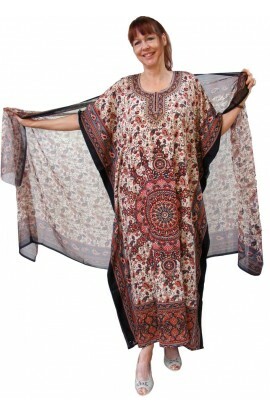 This long, full-length kaftan is made up in smooth velour. This fabric has an abstract tie-dyed pattern. Available in lengths 49, 53 or 57"
It is free-sized and loose fitting suitable for UK sizes from 14 to 30. Available in other sizes as a "bespoke" item.